Another interesting move from TEN programming will see the return of Blue Bloods soon -but curiously the show is getting an upgrade from ONE to TEN. Season Three “Family Business” premieres 9:30pm Monday August 26th, just a month before Season Four premieres in the US. A dangerous criminal from Danny’s past comes back to seek revenge and kidnaps Jackie. Meanwhile, Jamie meets his new partner, and a young officer is shaken after he accidentally shoots an innocent man. The series had a troubled run on TEN when it premiered in 2011, moving from Wednesdays to Fridays and eventually shuffled off to ONE. It’s rare indeed that a show gets an upgrade from a multichannel to primary channel –The Simpsons has been one case in point (although there have been suggestions it may head back to ELEVEN too). TEN’s 9:30pm Monday slot has been underperforming for too long, despite the excellent The Americans not getting a look in from most viewers (and I could write a whole other post on that topic). On the sluggish figures it has had it should have been moved weeks ago. Now that it is concluding and we see it replaced by a multichannel show from TEN’s CBS output deal, the question really has to be asked: does TEN now at a point where it has nothing else in its cupboard? With all the repeats of shows ch 10, 11 & One show, it would be great if they showed some of the early seasons of Blue Bloods. I missed a few eps when they were up against other shows and couldn’t tape them. Blue Bloods was rating less than 300k on Fridays when it was bumped to One two years. Ten will be hoping it appeals to Wanted viewers more than The Americans did. Ten seem pretty much resigned to 4th place on Monday nights. They probably have nothing that would do well there where as Blue Bloods won’t do better anywhere else so why not use it. @glennc – I see your point. 500k is too ambitious! Although, shows such as police procedurals like Blue Bloods, are easy to watch and pick up on as there is a new story each time so a figure close to that may be possible. That’s a Big Maybe. The only real problem TEN have is viewers forgetting the protagonists and their various relations. 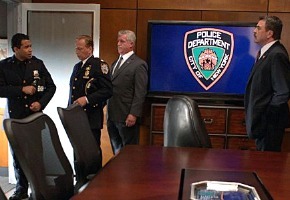 I suggest TEN screen a three-five minute ‘Previously on Blue Bloods…’ to appeal to viewers both new and old, with recaps dating back to key turning points in its first two seasons. A little bit of promotion wouldn’t hurt either, not excessive, but a little here and there. It hasn’t got much in the way of heavy viewing competition, so, I hope it can do an okay performance. You’re only asking that question now David? Have you been on sabbatical for the past few years or something? Would put money on this being un-done again as soon as new eps of higher rating shows are available in September…. Monday is usually jam packed – at least it was when Americans debuted. Our house was committed to Revenge, Dexter & Breaking Bad. While it’s less busy now, it’s only a matter of time…. @Eliot Ten would be stoked if Blue Bloods rated 500k in this timeslot. Think a more practical target is 300k. 300k would be a 50% improvement on what The Americans is currently getting. The Americans was launched on Monday night where Ten was struggling badly and The Biggest Loser provided a low and completely unsuitable lead-in. It was up against The Voice/Major Crimes and House Rules/Revenge. People just figured they had enough to watch on Monday nights without bothering with it. It rated only 487k for the premiere at 8:30pm and once it moved to its regular 9:30pm rapidly dropped below 200k. I have heard the Americans is good and my PVR has all the current eps. I refused to start watching until 10 had aired all of them. Still burnt from White Collar (i know it is screening now, but too much mucking about left me reluctant to watch another US show on 10! SO the poor ratings from my perspective is they can blame themselves for developing a culture of mistrust with launching new US shows. The launch of Renovations to Riches will hurt Under the Dome further!! When will networks learn?? Where’s The Devil wears Prada ? This move isn’t a wholly bad one, as this will definitely not rate as bad as The Americans in the timeslot. Yet, its numbers I feel won’t be too great. Maximum 500,000 I expect. since sows like Touch, Vegas, Medium and such have been axed or have ended I don’t think Ten are in any rush to play them. and encoring The Project after 11pm doesn’t help, they could air those shows there. couldn’t they just encore The Project on One or Eleven? so we don’t get behind on lower rated shows. New Girl had repeats on 11 once, they should just keep it there with new eps in place of Rules of Engagement or Raising Hope. don’t gimme this ‘they’ve run out of content’ cause they have plenty to show all year around. they’re just too stupid to think of anything. oh, where’s Sons of Anarchy Season 4?!?! Great news, I was wondering what was going to replace The Americans. I’m baffled as to why it doesn’t rate better here too. It is a massive hit in the US and has been renewed for another season. I’ve been wondering what happened to New Girl too, it’s been over a year since it was on here. The networks have 3 channels to fill instead of 1, are cutting back on their output deals and fewer US shows are rating well. So yes they are running out of shows. If a new show like the Americans is only going to rate 170k then something which a lot of people have enjoyed like Blue Bloods may do better than that on a primary channel where it gets flicked past more and is more likely to be spotted in the TV Guide. Nikita was moved from Go! to NIne because they ran out of late night filler. Hoping American Horror Story is on TEN not ELEVEN. Too cool to be overlooked. I love this show, and hate to admit that lately there has been such a large amount of great programming on that I still have half a dozen episodes of season 2 on my PVR to watch. But I really hope that moving Blue Bloods back to TEN won’t result in it being bumped if it doesn’t rate and having to wait months before it reappears like happened last time. @ James S – couldn’t agree more. They moved The New Normal to ELEVEN but it has been replaced half a dozen episodes before the end with repeats of Rules of Engagement (with it originally being 1 new RoE and 1 new TNN, but ended up being double RoE from 3 weeks ago till this week with it now finished). Why don’t Ten move New Girl over to Eleven? The Sitcom has a Young-Skewing Audience.